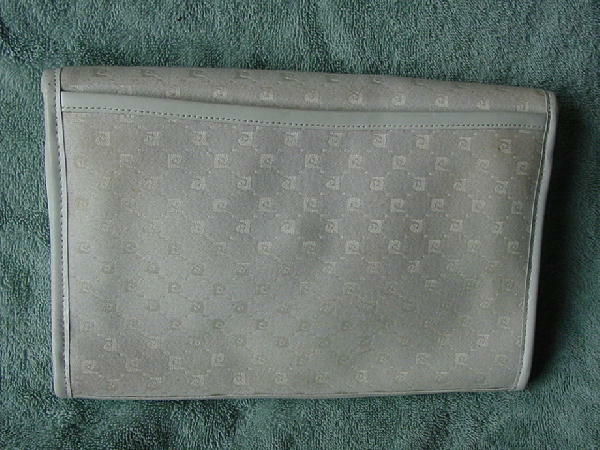 This creamy antique white fabric envelope style purse is by Pierre Cardin. 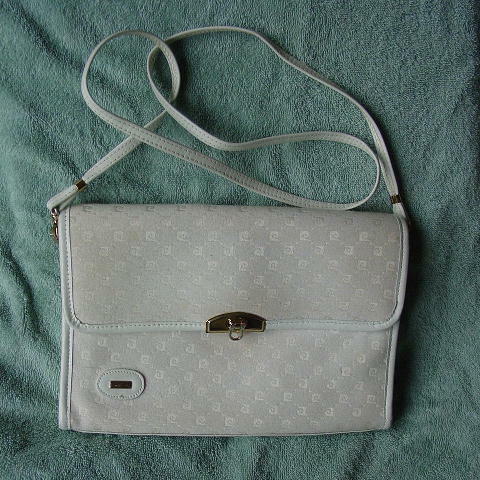 It has a white leather trim and detachable 41" long shoulder strap. The outer surface is covered by thread dots and the Pierre Cardin logo. There is a gold-tone rectangle with Pierre Cardin etched on the front on a white leather oval. It has a gold-tone clip closure and an outer zippered front pocket which is hidden under the front flap. It has a creamy bone interior lining with a zippered pocket which is lined in a black fabric. The outer back has a full open pocket with the same creamy bone lining. It's from a former Miami model, who only wore it once (to the opening of Miss Saigon in Fort Lauderdale in 1994).